I had planed a tour of Iceland in January hoping to capture the frozen landscapes and the blue naked glaciers visible during this time of year. I had hoped to photograph ice caves a part of this trip. I contacted a mountain guide in the area who pointed out a couple of places where one can find ice caves. We were trying to shoot some mountain landscapes in early soft light when clouds rolled in and ruined the colours, we therefore decided to quickly change plan and head for one of the ice caves we had information on. 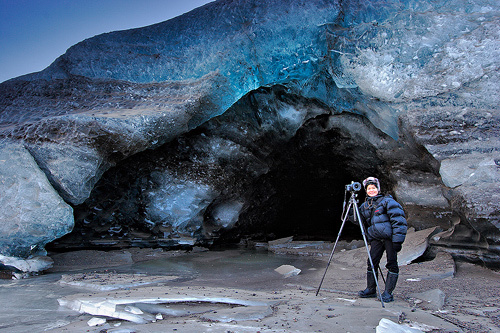 Shooting the ice cave was explorational. We did not know what to expect, how it would look like and how shooting conditions where inside. 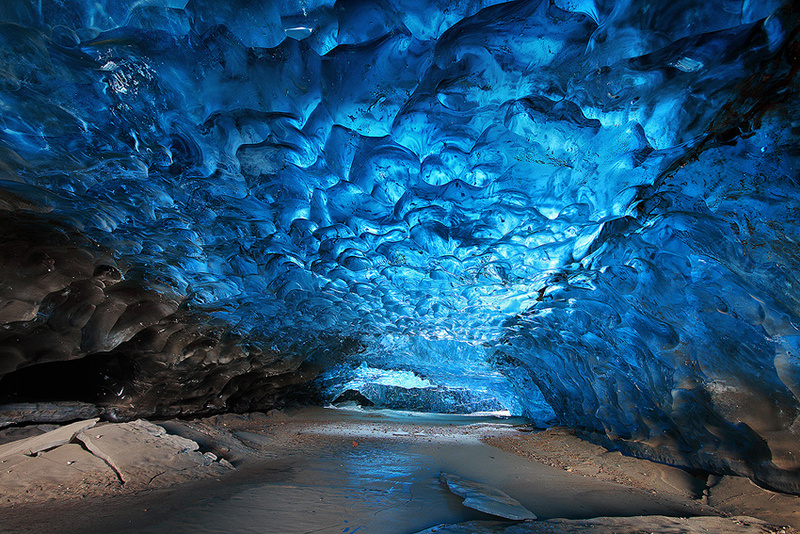 I had been in ice caves before I took up photography and I knew they can be dangerous. We had to assess if there was a danger of a collapse before entering. The extreme cold weather helped us keeping the ice hard and reducing risk of collapse. Once inside we were pleasantly surprised how blue and transparent to roof of the cave was, being in unstable territory made us a little edgy and every time there was a cracking sound coming from the movement of the glacier we would jump up and grab our gear. Soon we learned that the sounds where not dangerous but just the natural creeping movement of the glacier. I usually try to use graduated neutral density filters (GND) to balance the light in my landscape shots. This scene however was too dynamic at the wrong places of the frame to be able to use filters, having the brightest part of the image in the centre made the GNDs useless. I therefore had to bracket 3 shots with 1 stop between them to contain the very dynamic light in the scene. I used my Canon 5D MKII + EF 16-35mm F2.8 lens on a Gitzo tripod. All the images where shot with 30 seconds exposure at ISO 400. I used different apertures to bracket the 3 shots which gave me increased DOF in places where I needed and the varying brightness levels. No extra equipment was used. I used my 5 year old PC to process the images, quite time consuming but I will be getting a new PC soon. I used Canon?s Digital Photo Professional for the RAW processing and Adobe Photoshop to edit the images. The key to my processing is knowing what you want and visualizing the outcome of the processing before you start. I adjusted white balance, colour saturation and contrast adjustment while processing the RAW images. I outputted the 3 images as 16 bit TIFF files to Photoshop and then opened as 3 layers in order of the brightest as the top layer. I used a technique called exposure blending to combine the images by adding a mask on each layer and masking out areas of the brighter layer where I feel the image needed less exposure. I used some selective level adjustments to increase contrast in areas which where a little flat like in the shadowy parts of the blue ice. I did this by applying the Lasso Tool with large feather value on areas with flat contrast then adjusted the contrast to suit using Levels. The story of this picture was to inform viewers that most glacier ice is very different from what most people see of the outer surface. The weather and sun with its damaging ultra violet rays transforms the outer surface of glacier ice into white-ish ice. 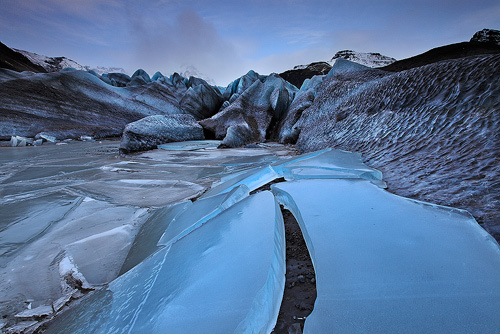 The real beauty of the centuries old compressed ice of a glacier lies underneath the damaged outer surface. This blue ice can be seen however under certain circumstances. 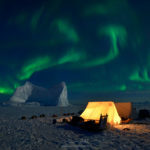 It can be seen in winter after long periods of rain when the surface layer of the glacier has been washed away and the weak Arctic winter sun can not re-damage it right away. It can also be seen in ice-caves like this one (unsafe in summer) and on floating icebergs that reveal their bottom side when they have recently rolled over. I tried to capture not only the cave but the very interesting roof as well. By pointing a very wide angle lens up towards the roof I could emphasize the roof but it also allowed me to use the inherent point of view distortion of a wide angle to blow up the scale of the top part of the image. I knew that the subject would be quite unique as this ice cave had not really been photographed before (it enters into a lagoon that needs to be frozen to access it). 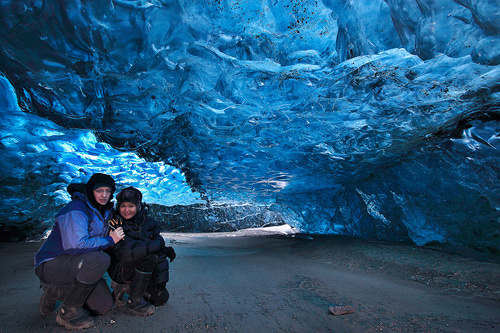 A fellow German photographer (Christian Klepp of www.lichtjahre.eu/) and my wife where with me and they where blown away be the intensity of colour and shape of the blue ice. So I knew beforehand that the subject itself would draw attention. But how people would like my capture and editing was and will always be an unknown. 1. 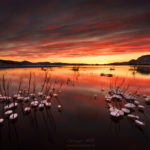 Knowing the places you visit and what they have to offer for the particular season, time of day and weather conditions leads to success in landscape photography. I study maps, sunlight angles, weather forecasts and get local updates on conditions of the locations I visit. Being at the right place at the right time is essential for landscape photography. 2. Be precise in what you do once you are in at the right place at the right time. Having gone through all the trouble getting to the location of shooting, nothing is worse than having too shallow depth of field or slightly off composition once you properly see your images on a computer screen at home. 3. Be efficient (while being precise). Know exactly where you keep all your equipment and make sure it is easily accessible once you need it. Searching for a filter hidden somewhere deep in your camera bag can cost you a shot of sudden brilliance. Ice caves should not be entered without consulting a local mountain guide with knowledge about the conditions and dangers of these places. Thank you a lot, Örvar. Tutorials like this help me a lot. I cannot believe what I am seeing here. Phenominal. Wow. A hearty congrats. Thanks for sharing this with the world! 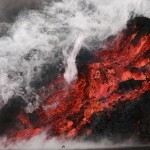 Hello, I am going to be visiting Iceland in August, and I would very much like to visit this location. Do you have GPS coordinates that you would be willing to share? Thank you very much for the beautiful photos! Ice caves are very dangerous and should not be entered without professional guidance. Winter is the time to visit them as summer heat melts them. This particular cave is gone now as it has melted away. 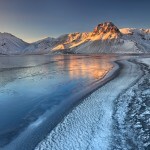 If you come in winter you should contact http://www.localguide.is for assistance. it is clear you are making the most of your monuiatn experience; Cody, some friends and just did a four hour walk around a pristine and untouched lake. It was heaven but nothing close to hearing a grumbling and moving glacier. Go Carol Go.